Emmys fashion tends to be more low key than what we see at other major awards shows. It was no surprise, then, that the red looks for this year's Annual Prime Time Emmy Awards were generally luke warm. Granted, there were definitely a few brow-raisers (Ahem, Heidi Klum's up-to-there Marchesa mini, Clare Danes' Armani Prive sparkler and January Jones' blue Atelier Versace gown). However, most stars seemed to play it pretty safe. Nonetheless, our focus was on the shoes. January Jones' love-it-or-hate-it moment was complicated by a lackluster shoe choice. While the Mad Men actress' black Miu Miu platform pumps are great on their own, they did nothing for her look. Anna Paquin opted for a warrior princess look in a black Alexander McQueen gown with a gold beaded neckline. The True Blood star's choice was a bit mature for her youthful looks, and her black patent Yves Saint Laurent Tribute pumps also failed to add anything of merit to the ensemble. Keri Russell's Jimmy Choo Lance sandals were a great accent to her easy, breezy accordion-pleated Vintage Scherrer dress from Decades. I do wonder, though, if this well-put-together look was a tad too laid back for an evening awards show. The high split and strapless neckline on Rutina Wesley's Douglas Hannant brush stroke-printed gown accented her ultra-toned arms and legs. 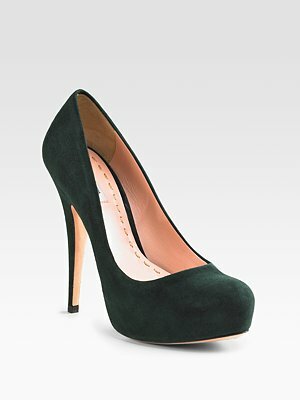 Good look trying to score the True Blood actress' Christian Louboutin Fortuna platforms. They seem to be no longer available at most places. Supermodel and Project Runway matron, Heidi Klum was one haute mama in her beaded Marchesa mini, and her sparkly spiked Christian Louboutin Pigalle pumps. I wish I had designer info on Lauren Graham's gladiator heels, Eva la Rue and Nicole Ari Parker's shoes. The kicker, though, is how so many celebrities shared information on shoes their gowns were too long to show. Numerous stars strutted down the red carpet in Jimmy Choo or Christian Louboutin (quel suprise). In addition, apparently, Tina Fey wore Giuseppe Zanotti, Jane Krakowski wore cobalt blue Ferragamo heels and Julie Benz sported Brian Atwood.